Hyderabad, Oct 14 (CRICKETNMORE): A standout performance by Umesh Yadav against the West Indies has prompted India skipper Virat Kohli to say that the pacer is a strong candidate for a place in the starting XI during next month's tour of Australia. 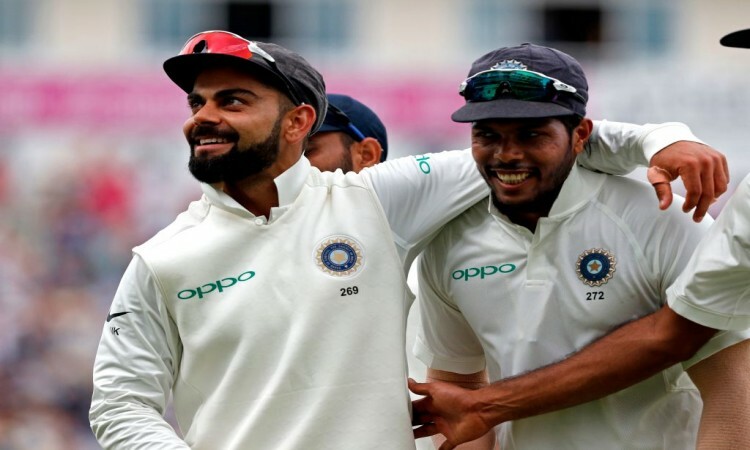 Umesh was the wrecker-in-chief in the second Test with match figures of 10/133 which made him the third Indian pacer with a ten-wicket haul in a home Test. The right-armer, who had figures of 6/88 in the first innings, bagged four wickets in the second innings conceding 45 runs and was also adjudged the 'Man of the Match'. "I think it was a standout performance in his career and something that he can build on," Kohli said at the post-match press conference. "Four Tests in Australia can be brutal because the (Kookaburra) ball does not do much like in England. So you have to come in and run in all day and hit the right area with pace. But I think from that point of view, Umesh is right up there to be featuring in Australia," he added. This is the second time since 2013 that India have blanked the West Indies 2-0 in a Test series at home. They will begin their four-Test series against Australia in Adelaide on December 6. "Because he (Umesh) has got the pace, he has got the fitness levels to run in all day, picks up wickets at crucial times and he gets good bounce as well, so it's a great headache to have. Obviously, all four guys, when they are touching 140 and when they are taking wickets for you, it is obviously something that any captain would like to have," Kohli said. "What has made Umesh's effort even more special is the fact he didn't have the support of Shardul Thakur, whose debut ended in a heartbreak due to a groin injury. The Vidarbha speedster bowled nearly 39 overs in humid conditions. "Outstanding effort (by Umesh). I thought with Shardul breaking down very early, to bowl like that in both innings was a great effort on his part. It showed the kind of fitness levels he had, to keep running in and bowl 140 clicks throughout the game and picking wickets and not just completing overs," the skipper added. Kohli put Umesh in the same league as Mohammed Shami and Bhuvneshwar Kumar. "Many people realise but he is a very, very talented bowler. He can bowl you unplayable deliveries every now and then which we experience in the nets all the time. He will just bowl a ball which you feel you couldn't have done anything else except getting out. He is gaining more confidence about his own game," he said. "He has come a long way. It's a great sign. Bowling is something that we need to keep as a major strength for us in order to feel that we have a chance to win series when we travel away from home as well. I think these guys (Umesh, Jasprit Bumrah, Bhuvneshwar, Shami and Ishant Sharma) are taking responsibility well."